When Nell reads the obituary of a former board member, Adeline Harrison, she makes a mental note to send flowers and doesn’t think twice about it—until FBI agent James Morrison shares his suspicions about the nature of Adeline’s death. It turns out that a number of other members of the local cultural community have died in the last few months, under similar circumstances. 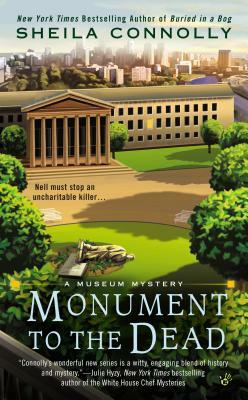 Sheila Connolly is the New York Times bestselling and Agatha Award–nominated author of the Museum Mystery series, the Orchard Mystery series, and the County Cork Mystery series. She has taught art history, structured and marketed municipal bonds for major cities, worked as a staff member on two statewide political campaigns, and served as a fund-raiser for several nonprofit organizations. She also managed her own consulting company, providing genealogical research services. In addition to genealogy, Sheila loves restoring old houses, visiting cemeteries, and traveling. Now a full-time writer, she thinks writing mysteries is a lot more fun than any of her previous occupations. She is married and has one daughter and two cats. Visit her online at www.sheilaconnolly.com.